It’s difficult to know where to begin on a post like this, because it’s been five days since we saw the tornado, and I’m on day three of being back at work and into the swing of things again. My body still has not mentally or physically recovered from the drive to Kansas and back to Pittsburgh, PA. So you understand why this post is just now being made! But given the amount of driving coupled with little sleep and a tornado setup that underperformed during daylight hours, I think a post is warranted despite its tardiness. MaryLeigh and I left Pittsburgh at 5a.m. on Friday, April 13 and drove straight to Derby, KS, arriving at 11:30pm that night. On the way to Kansas we picked up our friend Steve Barabas at the Kansas City airport to chase with us the following day. I had been watching the setup for April 14 all week and wondered daily whether or not it would be worth the loooong drive out to the plains and back. You see, since the setup fell on a Saturday I had (potentially) the unique opportunity to take off Friday and Monday from work to chase this setup. This would undoubtedly involve driving for hours on end and getting very little sleep over the course of nearly four days, but I believed it would be worth it if the setup actually looked like a historic tornado outbreak. And wouldn’t you know it, by the time the morning WRF model came out on Thursday, April 12, the setup indeed looked like a massive tornado outbreak! All computer models were in excellent agreement, so I honestly had no reason to believe there were not going to be tornadoes. So upon requesting the time off work, getting odds and ends together and going to the store for necessary road trip supplies, MaryLeigh and I were prepared for the long drive to Kansas the next morning. Convective outlook from the Storm Prediction Center produced the morning of April 13, 2012 valid April 14, 2012. People say that sometimes things look better in the light of day after a good night of sleep. Well I didn’t get the good sleep, but upon reviewing the latest weather data at 8a.m. on Saturday, April 14, things were looking up. None of the thunderstorms the models were forecasting had formed yet, so there was reason to be suspicious of their solution during the daytime. It still appeared supercells would form by 1pm, but enough instability would develop and tornadoes seemed likely. We drove west to Pratt and before much time had passed, supercells formed along the dryline over the eastern Texas panhandle and Oklahoma panhandles. We waited until the best looking storm got organized and showed good rotation before heading further west to view it. 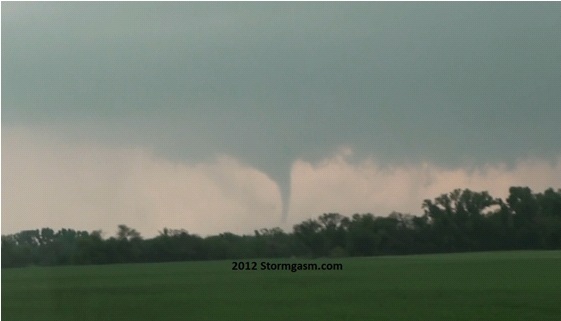 But it the storm produced a quick tornado before we got to it southwest of Greensburg, KS. In fact by the time we arrived on highway 400 west of Greensburg near Mulliville, KS the storm was actually falling apart. Something just wasn’t right. I had expected to see a large tornado on the ground, but instead was greeted with crappy looking outflow, scud and a convective mess. I decided we should just go east and get out ahead of the storms and wait for the storms that were currently intensifying to our southwest near the KS/OK border to get their act together. But the closest storm (southwest of Pratt) later did the same thing by dissipating, only it never (to my knowledge) produced a tornado…may not have even had a funnel for all I know. I was worried about falling behind the storms (they were moving northeast at 55mph), so I continued to drive east on highway 400. In the car frustration increased as I kept checking the radar and the warnings. No storms in Kansas or Oklahoma had any confirmed tornadoes, and it was after 4pm. To make matters worse, the radar signatures were not impressive – both on storm relative velocity and echo tops. Tops were struggling to surpass 40/45K feet. It was becoming obvious that the CAP was stronger than forecast and was causing the updrafts to struggle. No wonder this “Outbreak” wasn’t happening (yet). I seemed that maybe we should be further north where the upper air support was located. I decided it would be best to keep up with our storm (which looked like crap) and drive north on highway 17 to Hutchinson. For a little while our storm (located to out west several miles away) developed a massive beavers tail and that got our hopes up. Then I looked at the radar updates and the storm was clearly dying! The NWS issued a tornado warning, but I laughed because I knew it was over for this one. At that time the supercell well northwest of Hutchinson began rotating like crazy and a large tornado was immediately reported! That’s when I decided we had to attempt catching up with that storm. The problem was it was moving northeast at 50mph. But I knew it was highly possible the storm would slow down a lot since it just began producing tornadoes. We took highway 61 northeast through Hutchinson and unfortunately were caught in construction going 45mph for a long time. This destroyed our chances of catching the large tornado currently on the ground. However, upon reaching I-135 on the east side of McPherson, the radar image updated and I saw that the supercell had slowed down quite a bit, and was still located west of I-135 just southwest of Salina! We definitely had a chance to catch up up to it if we navigated effectively. Hope, determination, quick radar interpretation and fast map navigation came to the rescue. After taking I-135 north for several miles, we got off at an exit and took small farm roads east and north to Gypsum, KS. It was about that time that the tornado first touched down. 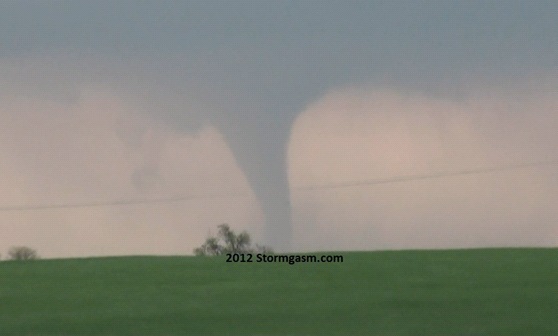 But being several miles south of it, we still had to fight to even remain in view of the tornado. The tornado took on a photogenic stovepipe appearance. Unfortunately, we were simply too far behind the storm to remain in good, consistent view of the tornado. For a couple minutes a hill and some trees blocked our view as we continued driving north and then east to keep up with the storm itself. From seeing that the rear flank downdraft was really slow to occlude the mesocyclone, I knew the tornado would be on the ground for several minutes (and it was). So I tried to get us into better position by continuing east a few miles and then north, instead of stopping initially with a view of the very photogenic stovepipe and capturing really good video and stills. Unfortunately, most of the tornado life-cycle was during a rope-out stage, and was hard to see initially due to repositioning and poor contrast. 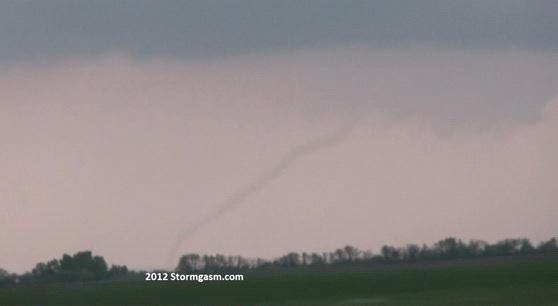 Upon reaching I-70 I captured a shot of the roping-out tornado (below). We could have easily driven north on a farm road and gotten into a better view for this, but it would have ruined our chances of getting much closer to the next tornado (assuming at the time their would be one, which there was not). Plus, I honestly didn’t know how much longer this rope would last! And that’s the gamble I made with this storm. I had no idea it wouldn’t produce another tornado during the daytime hours, nor did I know the stovepipe stage would only last for small portion of the tornado life. But it was a great looking supercell moving into a great environment, so go figure. I felt we were very fortunate to see this tornado after a frustrating first part of the chase and being forced to drop storms. The setup didn’t pan out like I thought it would during the daytime hours, so I consider us lucky to have seen a tornado. On the drive back to Derby, we stopped just off I-135 about 10-15 miles southeast of Lindsborg (north of McPherson) around 10pm or so. We watched a supercell with a confirmed tornado pass several miles to our northwest. The supercell exhibited strobe-light lightning in a way I’m not sure I’ve ever witnessed in 12+ years of storm chasing! The inflow winds were so powerful it almost knocked me over at one point! We witnessed two power flashes as the supercell passed to our northwest. It was quite spectacular. 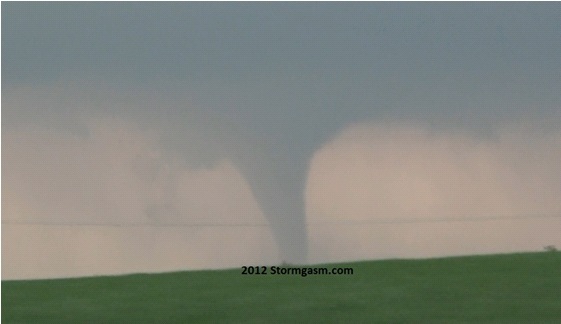 At the same time a tornado missed our friends house in Derby, KS (where we were staying the night) by only two miles! It was from the storm that developed over far northwest Oklahoma and began producing tornadoes within an hour of us dropping our dying storm and hauling it north. So when we arrived back in Derby late that night, we were lucky to get to their house having to maneuver around debris and tons of EM vehicles. We had no power at the house so it was extremely warm inside. And leaving he windows open was almost fruitless because a squall line was approaching and it was also very windy. But sleep eventually found its way to each of us out of pure exhaustion. MaryLeigh, Steve and I left Derby Sunday around lunch time on Sunday. We drove to eastern Oklahoma so he could meet up with a friend. MaryLeigh and I were pretty happy when we finally arrived back in Pittsburgh later the following day. Thanks for reading this novel. 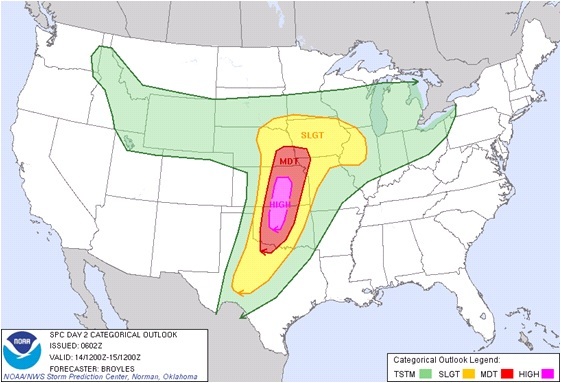 There will (hopefully) be to come in the next three weeks as the weather pattern gears up again for more tornadoes across the Great Plains in late April and early May! 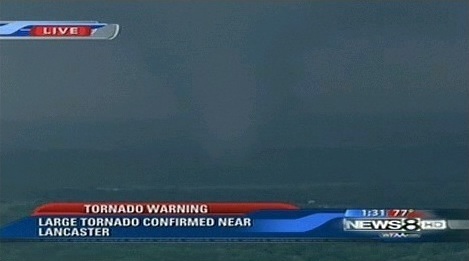 Screen capture from a live Dallas, TX news feed of Lancaster (south Dallas) tornado on April 3, 2012. Image courtesy of WFAA TV in Dallas, TX. Two damaging tornadoes moved through the Dallas/Fort Worth area today. 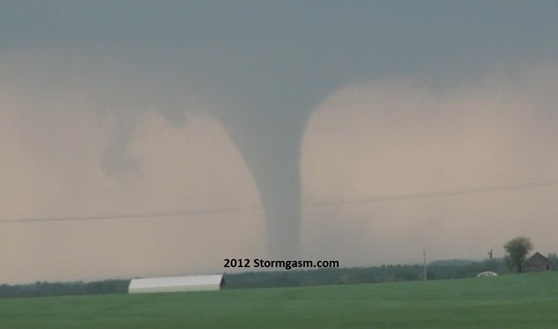 For several minutes both tornadoes were on the ground at the same time. Given the proximity the Dallas/Lancaster storm was to a TV station’s tower cam, I had the unique opportunity to view this tornado live for several minutes on my computer. 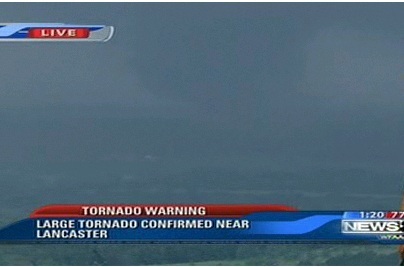 The image above is a screen capture of the tornado from the live feed. 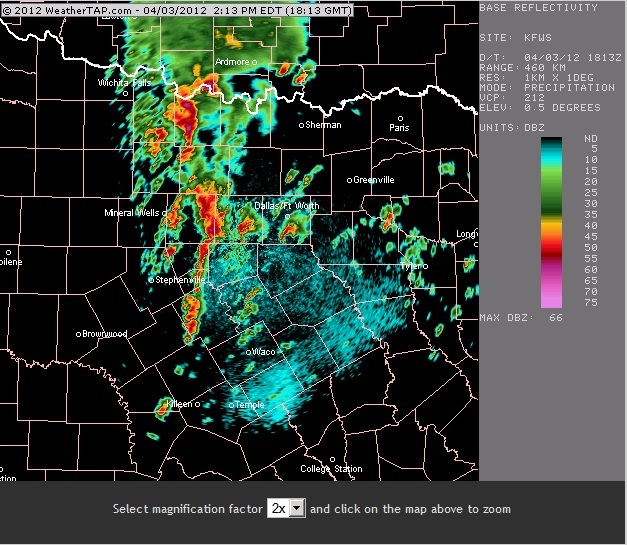 Radar image of the DFW area while both tornadoes were on the ground. While I viewed the live feed of the destructive tornado that moved through the south and east side of Dallas, another supercell was producing a large tornado on the south and east side of Fort Worth, moving through the Arlington area. No live feed was available, but the news did pan to a quick, previously recorded shot of that tornado, which appeared from a distance to be a large cone tornado. You can see the two well defined supercells in the Dallas and Fort Worth areas on the radar image above. These cells developed ahead of a line of thunderstorms. The image above gives you a good view of the tornado from a distance. 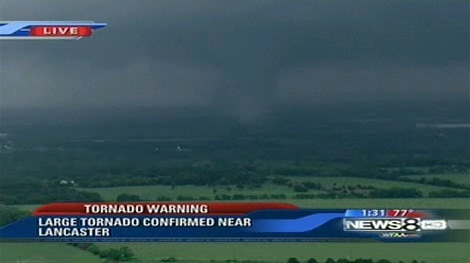 Again, seeing a tornado live on TV or through a live feed as it moves through a major metropolitan area is unreal. I watched the feed as the tornado moved through the southeast side of Dallas and ripped up trailers, structures and semi-trucks that were parked at a truck stop. Large pieces of debris were being thrown into the air. As I come to the end of this write-up, tornado warned supercells continue to move through the Dallas Fort Worth area. I’m afraid that quite extensive damage may be waiting for assessment once the day is over. Days like today remind me that we are living in a new era of storm chasing/viewing/spotting. The era of live feeds. This has been around for a few years now, and today isn’t even the best example since the feed was from a TV tower cam! However, more and more storm chasers are taking advantage of broadband cell phone internet access on the road and providing live tornado feeds.